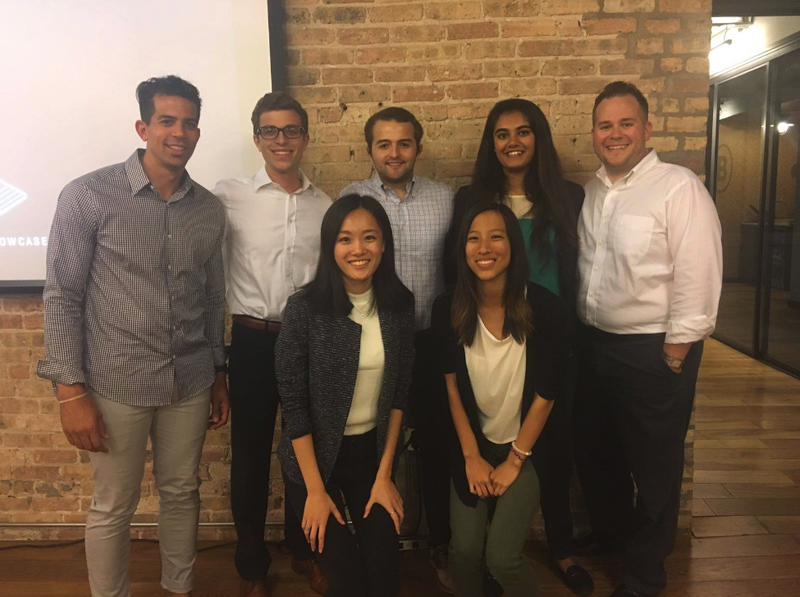 Ruchi, with Alex and Brian from Coder Inc., along with our other Summer 2017 Chicago fellows who interned with Coder Inc. This blog post was written by Ruchi Patel, one of our Summer 2017 Chicago fellows. After my sophomore year at the Pennsylvania State University, I was looking for an opportunity to get some work experience and advance my professional development. I came across Sage Corps and decided to apply, taking a leap of faith to have an extremely unconventional internship experience, and it ended up being one of the best decisions I have ever made. I spent the summer with an amazing company, Coder Inc., based in Chicago. As an engineering student, I found myself straying far away from traditional tasks and dove deep into web/application development, venture development, sales and marketing, Blockchain technology, and everything in between. Upon returning to Penn State after the most amazing experience with Sage Corps, I sat down to reflect on the summer and realized that I had taken away so much more than I had thought. I have grown to be a better learner, employee, and human being. Fully aware of how cliché that sounds, I will attempt to explain the key lessons I’ve learned through my Sage Corps experience in this short recollection. 1. Your degree doesn’t define you. The biggest misconception that several college students (myself included) fall for is that a degree is like a signed contract to a specific field. Let me clear that up right now — nothing I did this summer was in any way related to the engineering curriculum I study at school — and this was by choice. In the startup world, roles are less strictly defined than in other professional environments, and every person wears as many or as few hats as they want. You will have the freedom to explore new interests. It’s up to you to demonstrate interest and capability to take on projects and tasks that may deviate from your current knowledge. And this will, more often than not, result in a LOT of learning and growth. Restricting yourself to the limitations of one degree field will not only hinder your learning, but may even prevent you from discovering new passions and interests and things you might be really great at. Make yourself as uncomfortable as possible, as you never know what amazing opportunities exist past the traditional field of vision you may trap yourself in. The worst that can happen is that you find out you don’t enjoy something — and even that is an extremely valuable thing to know. 2. Take advantage of every event and opportunity — no exceptions. Sage Corps will open more doors for you than you can keep track of, and they won’t always be highlighted and underlined. Seek out the opportunities to meet the amazing people that make up the startup community of your city. Go to every event that Sage Corps provides the opportunity to attend, and ask for more recommendations. Each event is carefully picked because Sage Corps HQ believes that we can benefit from them as students, young professionals and people. You will learn a great deal just from attending, and you'll get bonus points for talking to people (more about that later). The city you’re in probably has a reasonably established startup community, and the events that occur within that community are usually attended by important people with important stories. It’s a great way to get involved in “startup life” outside of your work, and there is always something really cool to see and be a part of. Even if you’re inclined to grab dinner with friends instead of going to that networking event HQ told you about, don’t. I guarantee that good friends will appreciate you grasping learning opportunities— and will maybe even join you. 3. Remember everyone you meet. In the entrepreneurship community, everybody wants to help you get to where you want to be. As students, we are like blank slates. Our thinking isn’t yet confined by industry “norms,” and we typically don’t like to follow rules. We have our whole lives ahead of us to experience as much as we want to, and the people you meet will recognize that and will want to help you take advantage of that. You will have the opportunity to go to more networking events than students normally do, so make sure that you actually NETWORK. Shake hands, get a business card, and make a connection. Make a commitment to send a quick note to anyone you’re interested in continuing a conversation with, and connect with people on LinkedIn. Even if you don’t want to harness connections you make for professional reasons, smart people can serve as invaluable mentors throughout your college experience and the rest of your life. 4. …and you can learn something from everyone. Tell them everything about you and listen to everything about them. You never know what distant connection you two share, and that may be the starting point of a mutually fruitful relationship. Surround yourself with people who are smarter than you; the amount of knowledge you can accumulate from talking to intelligent, experienced people is greater than any textbook you will ever read. I speak not only for Chicago but for anyone in the entrepreneurial community anywhere when I say that nobody got to where they are without the help of people around them, and they will therefore very likely be willing to share as much as they can with you. I’ve met founders who readily disclosed typically confidential information because they believed there was something to learn from the failures they encountered. One thing you will quickly realize is that transparency and humility are very common traits of people in these communities. There will be an answer to every question you have, so ask away. Just be sure to listen and remember everything. 5. Your work will speak for itself, and your humility will take you further than the college seal on your degree. Be open to criticism, but own your work. It’s yours, be proud of it, and put in everything you have to make sure you are doing your best work. It won’t go unnoticed. People always pay attention to sincere, hard work — so seek tasks that you’re interested in and give them your all. The best thing about working at a startup is that you will be able to see your project through from start to finish. I got to work on important projects and even present my work directly to clients. If there is an “extra mile” potential in what you’re working on, go the extra mile! Doing good work without begging for praise or recognition is the best way to get people to respect and appreciate you. Everybody is paying attention, especially in a work environment like a startup. One thing I am certain about is that your work will speak for itself, so let it. If you want to do more but don’t know how, ask questions, learn and deliver. You won’t get a gold star, but you will get all the right attention— and that will pay off. 6. Don’t be afraid to ask for help (sorry for being so predictable). This one is the most commonly given, and under-used, pieces of professional advice I’ve ever heard. Hear me out. Being right all the time and knowing everything isn’t a thing. There will be times when you run into problems that you don’t know how to get out of. Doing stuff, messing up, and doing them again is a surefire way to learn a lot more than playing it safe the entire time. Your superiors know that you’re there to learn as much as you can, and sitting on something you don’t know how to do for too long will result in sub-standard results, a lack of learning, and a lot of wasted time. Ask for help more than you think you need to. On a related note, don’t be afraid to speak up if you want to try working on something else. It’s like getting a bad haircut. It’s better to speak up and (maybe) make the hairdresser and yourself feel uncomfortable for 30 seconds rather than live with a haircut you’re not happy with. Knowing what you don’t like is as important as knowing what you do like; it helps to shape your interests and hone your strengths. 7. Thinking outside the box is easier than you think it is. Creativity, imagination and innovation are some of the greatest and most valued professional strengths I’ve witnessed throughout my experiences. No, you don’t have to be “born with it” or be Thomas Edison to think outside of the box. If you have an idea that sounds crazy, it probably is, but it also has the potential to be really good. Taking risks is directly proportional to creativity, and both involve taking a road less traveled. In a small company, chances are that whatever is picking your brain is uncharted territory (to some extent) to the rest of your team, too. Brainstorm, speak your ideas and forget (most of) the rules; it will probably leave you in a better spot. And sometimes it won’t. Sometimes your/your team’s ideas won’t work, and that’s okay. Translating “failure” into “learning opportunity” is hard, but it's the most valuable thing you can do both for yourself and the rest of your team, and that will DEFINITELY leave you in a better spot. 8. Bring everything you have to the table, and believe that it is valued. Don’t hide behind a laptop screen for the duration of your experience. Be social and play an active role in your startup—it’s the only way to give your work a personality. Make your opinions known and realize that there is a reason you are where you are, and it’s because your startup believes that you had something that they could benefit from. Prove it. Be yourself. Keep reminding yourself that you are where you are to learn and grow. Take advantage of that. Be confident, be deliberate. If you know that you are valuable and important to your startup, you will be more likely to be treated as such. Engage in meaningful conversations, don’t be afraid to voice your opinion, and trust that the learning process will always point you in the right direction. Immerse yourself completely in this experience in and out of the office, get your hands dirty, mess up, and learn as much as you can. I found a new, exciting career path from my Sage Corps experience that I’m so excited to pursue, I have a ton of great stories and reflections from my time in Chicago, and I’ve made some incredible connections as well. There’s a lot to take away from your experiences, but only if you let yourself take it all in! Ready to put Ruchi's lessons to the test? This piece was written by Sarah Rudd, Sage Corps' marketing intern. When we launched our Summer 2017 Sage Corps Photo Challenge, we did not expect to consistently receive high-quality photos like we did from Jack Bosworth. Jack was ultimately announced as one of the co-winners of the Photo Challenge. We reached out to him to see if he would be interested in sharing some additional photos and context with us from his time in Singapore, and he was more than happy to. We hope you enjoy! "One of the fun things about working for a startup is that often the office is a modern co-working space. 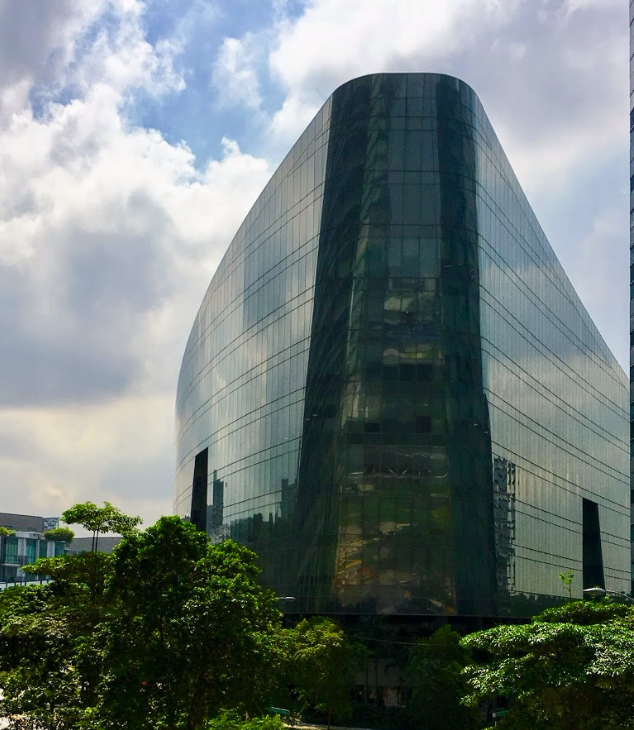 During my internship I was pretty lucky to have spent my time in the heart of Singapore’s start-up ecosystem at a state of the art innovation studio." "The space was actually created by one of Singapore's largest banks for the purpose collaborating with startups. The cool part, however, is that the innovation studio is located in the Sandcrawler building." Named and designed after the Star Wars vehicle, this building is the headquarters for Lucasfilm and Disney in Asia. Although the Star Wars and Disney floors are strictly off limits, I did manage to find the Yoda statue in the gardens." "Living abroad for the summer opens up a lot of opportunities for travel. Being located in Singapore, I was in a great location to reach many other amazing locations. One weekend, another fellow in my cohort, Tommy Ng, and I spent a few days in Cambodia. We had an awesome experience visiting Angkor Wat, the largest temple in the world. It was incredible to see and learn about the history and culture of this historic place." Thanks, Jack! To all of our readers, be sure to follow our social channels to check out more content from our fellows! Camila (left) with her Paris cohort. This blog piece was written Camila Kaplunov, one of our Summer 2017 Paris fellows, and edited by Sarah Rudd, our summer marketing intern. When I arrived in Paris as a Sage Corps fellow, I was pleasantly surprised by the amount of orientation programs, networking events, and activities that Sage Corps had arranged for our cohort. One orientation activity that sticks out to me as being particularly beneficial was the “pitch” practice that we participated in during our first few days of the program. My orientation leader, Milette, taught us how to formally start a conversation with a business owner, and gave us a step-by-step explanation how to come up with a 30 second pitch. She mentioned the importance of covering topics such as an introduction about ourselves, an explanation of why we were at the conference, what we were looking to get out of it, and how we could potentially benefit whatever company we were pitching ourselves to. Then, she gave all of the fellows five minutes to draft a practice pitch to deliver to the rest of the group. By doing this, Milette helped us get out of us our comfort zones. By having the opportunity to practice my pitch with this activity, I was able to solidify my final delivery for the place where it mattered the most: Vivatech. To say that Vivatech was overwhelming would be an understatement. As a 19 year old college student with limited experience networking, socializing with well-established CEO’s, and delivering myself as a potential employee, I felt like I was in over my head (to say the least). It took me awhile to get accustomed to the hustle and bustle of such a large-scale, immersive networking event like Vivatech. Especially as a non-French speaking American student, facilitating simple conversation became a nearly impossible task. Eventually, a nice gentleman approached me, extended his hand out and said, “Hello, I am Sabri. What brings you to Vivatech this afternoon?” I was excited that I finally had an opportunity to practice my networking skills! I extended my hand, gave a firm shake, and began to deliver my long-awaited pitch. After handing me his card, Sabri said goodbye and went on with his day; it wasn't until later that I realized he was the founder of TEDxParis. Without Sage Corps’ attention to detail in getting us prepared for such a large-scale networking event like Vivatech, I honestly don't think I would have ever mustered the confidence to carry on a conversation with such an esteemed individual like Sabri. I left that conversation with a pep in my step. I had attempted networking for the very first time and found a newfound sense of confidence to take on the rest of the conference with ease. I swept back and forth from the crowded aisles of the “startup” sections, confidently describing myself to potential employers; it was exhilarating. As time went on, I began to get quite comfortable with what once seemed to be the impossible task of socializing with strangers in a foreign country; I found myself getting used to the world of networking. Whether or not you're new to networking or job hunting, there are three takeaways I would like to share with you from my experience at Vivatech. Hopefully you can learn a little bit from my personal experience. 1. “Smile and Shake.” You never know how far a bright smile and firm handshake can take you in the competitive world of business. 2. Don't be afraid to be on your own. Often times, young students like me can be intimidated by the thought of speaking to strangers. However, it’s important to take advantage of any opportunity you have to have a meaningful conversation. So go out on your own and take on the big bad world of networking. You’d be surprised with the amount of people you will meet and, better yet, potential friends, co-workers, or even future bosses. 3. Lastly, have fun! I wish I didn't have to be so cliche, but I would hate myself if I did not add this very important piece of advice in. So many people lose themselves in the act of networking. Yes, networking can get very aggressive and can provoke a lot of emotions. But, making an effort to enjoy the process of meeting new people not only makes the experience more enjoyable for you, but also for the person you are speaking to. So, what are you waiting for? Get out there and start networking! This blog post was written by Sarah Rudd, Sage Corps' summer marketing intern. At Sage Corps, we strongly believe that interning with a tech startup can be an invaluable, life-changing experience. Nothing makes us happier than knowing that our fellows have meaningful, eye-opening experiences in the field of entrepreneurship. Take Tudor Dorobantu, for example. He’s a Romanian student studying at Boston University who came to Chicago to work with a startup, Sente, and was then sent to Istanbul to help train international startups for the company's summer “Internet of Things” program. Sounds pretty cool, right? I sat down with Tudor to hear more about his experience. According to the company's Facebook page, Sente is “an 1871 Chicago based international accelerator for startups in Turkey, Nordics, Balkans and other emerging startup ecosystems.” It was founded in 2008 by Serhat Cicekoglu (CEO). Gerod Carfantan joined the company in July 2016, as the COO, and the company now has grown to six employees. Sente helps provide incubation and business development services for startups. The company launches a series of programs for selected startups to help them become successful businesses. Sente is currently running its “Internet of Things” program, which is in its sixth week out of 12. In August it will launch its “LandInChicago” program, followed by its “New Mobility” program in September. Through its programming, the company has helped more than two hundred startups grow and develop. Born and raised in Bucharest, Romania, Tudor is a rising senior at Boston University studying Finance and Information Systems with a minor in Computer Science. Tudor is the VP of Tutoring for the university’s Financial Modeling club, and he credits his involvement with this organization for providing him with helpful experience in financial modeling. Tudor felt that an American internship would be beneficial to his career, and that’s when he found Sage Corps. He ultimately applied to the Sage Corps Summer 2017 program in Chicago and was placed as an analyst intern with Sente. Tudor joined Sente right as the team was leaving for Istanbul to kick off its “Internet of Things” program. Tudor also explained that his role in Istanbul was to help give real advice to real startups and help them build their businesses. From both his time in Istanbul and with Sente in general, Tudor has already been able to identify the benefits of working for a globalized startup. Prior to working with Sente, Tudor held a corporate internship with KPMG Romania, and he was able to notice an immediate difference in the responsibilities he was given and the room for potential growth in each position. "We see sente.link as the connection point between startups, investors and institutions in different parts of the world. So, it’s important for us to have people on the team that can bring in a diverse experience and diverse cultural backgrounds. As an international student with life experience in both the US and Romania, Tudor is a great fit. He’s also been able to contribute immediately – as a startup ourselves and the fact we work with so many startups, it’s given him the ability to both contribute with his strong analytical skills and also learn quite a bit about a lot of different sides of the business, plus experience the energy of the City of Chicago. Overall I think it’s been a great experience for both Sente and for Tudor." He also said that is is now more interested in a future position that involves working with people. We are excited to have played a role in Tudor’s internship experience, and are excited to continue to help our fellows to reach a new level of professional growth, and a widened exposure to the globalized workplace. This post was written by Emily Labattaglia, a member of our 2016 summer cohort in Hong Kong. It’s unusual to reveal the reasoning for a story’s title at the very beginning. However, if I could truly encapsulate my experience this past summer in one word, it is endless. Although summer has come to an end, and we’re all well into another year of classes, what I’ve learned and experienced this past summer will stick with me forever. I call it the endless summer, for many reasons of which I am about to dive into. I embarked on this journey to Hong Kong with an open mind, an eager heart, and an ambition and passion to see more and do more. What I came back with is more than words can adequately express. With Sage Corps, I was given two obvious opportunities: 1) to immerse myself in the startup scene and 2) to experience a different culture and what it’s like to live in a city abroad. However, with these two obvious opportunities and the right perspective on things come endless opportunities. At my startup, Steel Available, I worked alongside the CEO and two co-founders on a daily basis. I learned the ins and outs of launching a startup - their struggles, milestones, successes, and failures. I was given a great deal of responsibility, and really felt that I had complete ownership of my projects and it was my company too. It’s definitely exciting and made me want to go to work each day and check the next tasks off of my to do list. There were even nights that I stayed later in the office just because I wanted to, the environment was energetic yet comforting. My startup was based in an accelerator and co-working space called Blueprint. Being surrounded by high-energy, motivated, entrepreneurs and hearing their stories truly instilled in me a sense of determination and a feeling that I could do anything I put my mind and energy to. There were always other entrepreneurs next to me with the same mission. My experience led me to realize and value the importance of the people by my side. My bosses became my friends. It was a sad farewell, especially after a summer filled of team bonding activities such as squash, swimming, family dinners, sushi and sake, and even karaoke! So at the end of the work days, I would make the 15 minute walk back home. And there is nothing more exhilarating than walking on unexplored streets, hearing people speak a language you don’t know, and seeing signs you can’t read. You’re opened up to worlds you don’t know and haven’t yet explored, and it pushes you to keep learning and experiencing. Hong Kong is rich in culture, food, and geography. We would spend the weekdays working and the weeknights exploring the city, meeting new people, and eating delicious food. The city is home to cuisines from all over the world, but my favorite was definitely going out for dim sum and eating xiaolongbao (soup dumplings)! On the weekends, we were hiking mountains and riding speed boats to secret beaches. Hong Kong is an extremely diverse city - in people and geography. I encountered people from all over the world, speaking many languages. It’s a buzzing city with endless things to do and see, but then there is beautiful untouched nature close by. A break from the bustling city is only a subway or ‘minibus’ ride away, and you’re in a beach paradise or at the beginning of a challenging hike to the top of Hong Kong. The combination of being abroad and working at a startup makes for a powerful one. You are exposed to unfamiliarities that force you to exit your comfort zone. It’s being faced with trying new foods, learning new customs, networking with people from across the world, and seeing breathtaking sites and views that give you the sense of motivation and inspiration. The intangibles I learned from my experience with Sage Corps has taught me endless lessons and opened up endless possibilities for my future. I can’t wait to see what’s next.